A book that answers the question, why do EOS and Scaling Up work? Patience yields consistency, stamina, and results. With patience comes consistency, with consistency comes stamina, and with stamina comes incredible repeatable results. The Patient Organization holds the 7 keys to unlocking the power inside your Organizational Operating System (OOS). Weather it is Rockefeller Habits, Scaling Up, Holocracy, The Advantage, 4DX, Traction, EOS®, or a self-developed system. It will answer why does EOS work? Why does Traction work? Why does Scaling Up work? and how does EOS work? how does Traction work, and how does Scaling Up work etc. etc.? 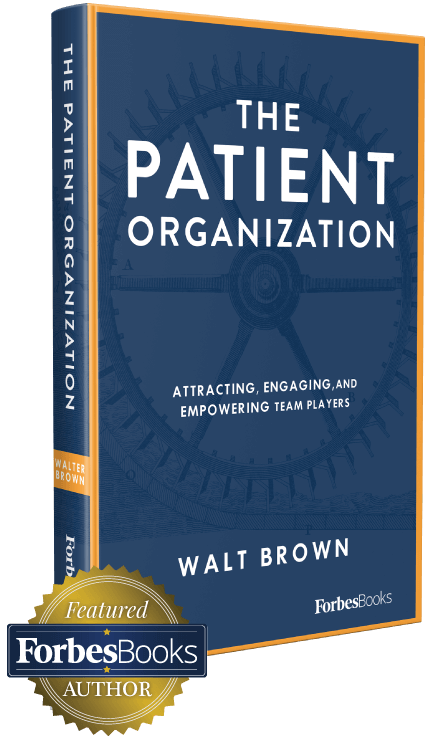 The Patient Organization and the 7 Questions will make your system come alive for your employees. Often, from your employees perspective, your OOS installation is seen as something you are doing to them as opposed to something you are doing for them. With The Patient Organization’s message and promise you will be able to let them see for themselves that your investment into an OOS is something you are doing for them. Your employees will be able to tune into their favorite channel WIIFM – What’s In It For Me – and see this is something you are doing For them! When you can make and then keep this promise, you are going to create a Patient Organization, an organization where everyone who is part of it wants to be. It is how you attract, engage and retain your great people. If your are asking yourself the following questions? Do I know how I will attract, engage, empower, and retain the worker of the future—our fresh workforce? after the next economic opportunity, i.e. a downturn? Do I know how to address the scourge of instant competitor imitation? Do I know how strong my organization is? Do I know how to measure the strength of the culture in my organization? Do I really know we are a “Best Place to Work” organization? Or did we just win the empty beauty contest? The key to lasting success in today’s rapidly changing business landscape is in knowing the answers and Walt wrote this book to help you discover yours. Ready to make your OOS investment in EOS, Traction, 4DX, Holocracy, or Scaling Up make an impact, really pay off? Then good, read the book and feel free to reach out to Walt with any questions. By clicking the submit button, you are agreeing to receive email updates from Walt Brown. You can unsubscribe at any time. “What I like best about this is that it’s full of what I call “Waltisms”. As Integrator at Counter Culture, I rely heavily not only on EOS but on the lessons peppered in the EOS coaching from you. I recite them often as “Waltisms” – nuggets of wisdom or thought provoking questions that help drive an organization’s implementation of an OOS. The Patient Organization compliments EOS well because it helps further define the connection a leader and a company has with the most important (in my opinion) key function of EOS: People. Let’s be honest, the EOS tool for the quarterly conversation is conceptual, but this makes it very tangible. The concept of EATT is also really important. Much more concise than Five Dysfunctions and logically connects trust to actions: trying , adapting, evolving. It’s a powerful reminder of the value and necessity of trust. Do I understand and embrace what I am Accountable for? Do I understand and embrace how I am Measured? Do I understand and embrace how I am Heard? Do I understand and embrace how I am Developed? Do I understand and embrace how I maintain Balance?